The Obi we use are from the 20th century, dating Pre-WWII to approximately 1986. The oldest are referred to as vintage, while those woven after 1960 are considered quite old. Gold and metallic threads, as well as the overall fabric may present with a rich patina that will darken with age. Silver and gold metallic are achieved by using gold and silver coated threads. Threads with very high sheen are also coated and called Urishi. There will be snags and small areas of slight discoloration which are all considered part of the charm of these old textiles. Permanent fold lines and wrinkles will sometimes be present, as most all obi have been worn and tied as part of formal Japanese dress. 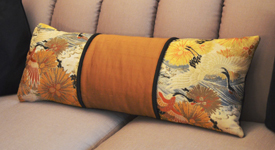 The touch of obi vary greatly from soft to quite firm, even stiff tapestries. Some surfaces are very smooth while others are textural. The sheen my be flat or nearly high gloss. 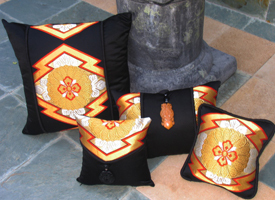 The obi presented are 100% silk or a silk and synthetic blend. 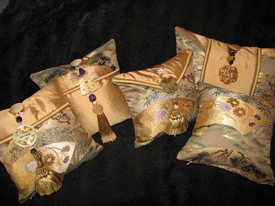 Most often the synthetic fabric used in silk blends is Jinken or rayon. The coordinating fabrics we use are 100% silk dupioni or taffetta. 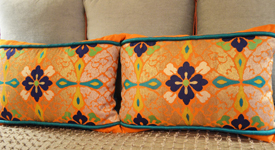 The reverse side of a pillow or wall hanging is always a solid coordinating silk. Usually this fabric is new. Very occasionally we are able to use solid fabric taken from the reverse side of an Obi. It is best to place the fabric out of direct sunlight, which may cause fading and deterioration of fibers. Please avoid cleaning, or if necessary, consult an experienced professional dry cleaner.